From 1938, the set is in used condition. their is wear on the box and the little mirror fell off the microscope. the set is incomplete, see the pictures for condition and whats included. the box is still solid, the hinge is good and it still has the little strings on sides. 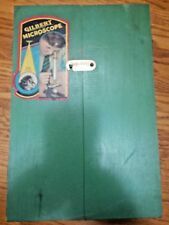 Gilbert Microscope and Lab Set- #13055. NO MICROSCOPE! Set includes: instruction booklets, Test tubes with fly, bee, Oregon Balsam, Dentured alcohol, thinner, PVA solution, safranin stain, glycerin, xylene, diatomaceous Earth, 2 empty test tubes, fish scales in box, labels in box, cover glasses in box, 7 slides, 1 dropper. It is used. Zoom in and zoom out.